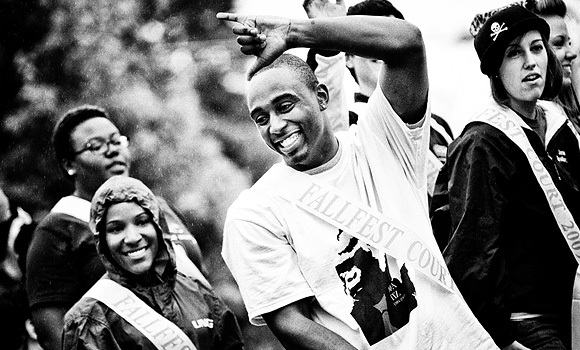 Renwick Pridgeon '09 , who joined Alpha Phi Alpha in Spring 2007, rides in the 2009 Parade of Chariots. For 30 years, the brothers of the Pi Zeta chapter of Alpha Phi Alpha Fraternity Inc. have embraced all three on the UNCG campus. Pioneers, they were the first Black Greek Letter fraternity on campus. This Homecoming, the brothers will return to UNCG to celebrate their bonds — both the unbreakable fraternal ties and their membership into the university’s Great Unbroken Band. Much has changed in the three decades since the Alphas arrived at UNCG, said Anjan Basu, who joined the fraternity in 1999 while a student at UNCG. “A lot of the things that students appreciate now — like the multicultural center — that was advocated for by my generation at UNCG, back in the late ’90s,” he said. True to their fraternity motto — “First of all, service to all, we shall transcend all” — the brothers have planned a weekend of celebration and service. Events include an awards ceremony that will honor people who have offered tremendous service to the UNCG community, Basu said. They’ll also participate in the 10th annual All Black Attire Party, which raises money for a number of endowed scholarships at the university. Among those awards is the Pamela Wilson Scholarship, which honors the memory and work of its namesake, the director of Multicultural Affairs at UNCG until her untimely death in March 2002. But no matter where life has taken them, thoughts of their fraternal bonds are never far from mind.